If your vehicle isn’t working, it isn’t earning money. If it doesn’t perform the way you need, it’s reducing your efficiency. We understand what mobile professionals want from their vehicles. We listen and offer innovative, productivity-boosting solutions. Whether you’re fitting a commercial van, looking for a truck cap that suits your particular line of work, or you just need accessories that make the job easier, we can help. Every mobile business has unique needs and there’s no one-size-fits-all solution. That’s why we carry a wide range of products from well-known and well-respected manufacturers. And if nothing off-the-shelf is quite right, we have the skills to design and install fully custom solutions. If you’d like to see samples of our work, just ask about our demonstration vehicles. We’re proud to say that Sterling has been awarded National Safety Mark Certification by Transport Canada. 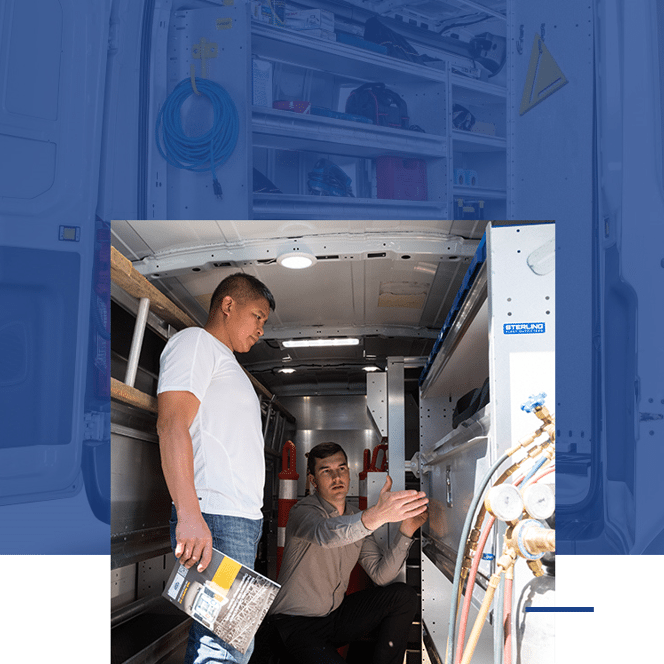 This lets us add the National Safety Mark to the vehicles we up-fit and demonstrates our commitment to safe and reliable installation practices. Wholly focused on mobile solutions, we source components and systems from many different suppliers to better meet the needs of our customers. From shelving and inverters to truck caps, we have the resources to make you – and your business – more productive. When you choose Sterling Fleet Outfitters we’re with you all the way, from defining your needs to installing the equipment. With our industry-leading warranty coverage, we’re there for you afterwards, too. Our commercial outfitting products meet standards set by Ford, Nissan, GM and Dodge. That means they qualify for incentive and rebate programs that can yield big savings for you. Thanks for your fast response. You guys are great to deal with!